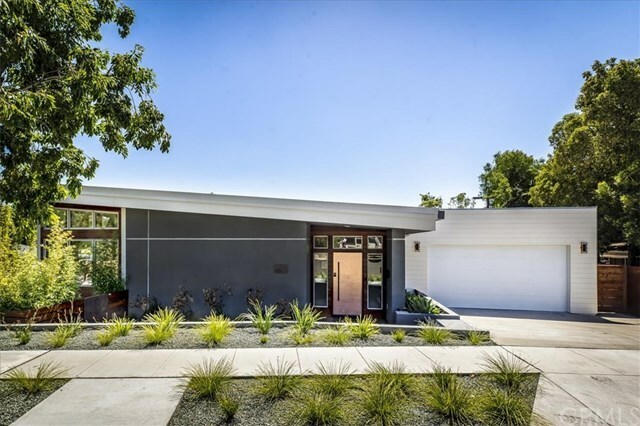 Beautifully designed, modern abode in the highly desirable Sinsheimer neighborhood of San Luis Obispo. This newly constructed home features three spacious bedrooms, plus an office that could be used as a fourth bedroom, and two bathrooms in just over 2,100 square feet of living space. The interior of the home includes an open concept living room, kitchen, and dining area with wood casement windows, a bi-folding door for indoor and outdoor living, and a wet bar with wine fridge. The indoor floor-to-ceiling fireplace at the living room is a statement piece, while the kitchen boasts Carrara marble counter tops and an oversized center island with seating. The stucco exterior of the home is complimented with IPE wood siding, and includes a spacious rear yard with a Gabion rock wall and outdoor firepit for entertaining. Additional amenities include air conditioning, and close proximity to Sinsheimer Park, Elementary School, and bike and hiking paths. The level of detail in this home is remarkable and must be seen in person to fully appreciate.